We are passionate about your business – producers and on-farm economics. Ours is not a one-size-fits-all approach, but a customized solution for your set of problems. Navigating the dairy markets is rarely easy. Staying on top of fundamentals, developing a risk management stratagem and executing the plan… all off this is challenging, time-consuming and often overwhelming. But, in today’s volatile dairy and grain markets, managing margins has become more critical than ever. Blimling and Associates can be your trusted partner in sorting through it all and protecting your bottom line. 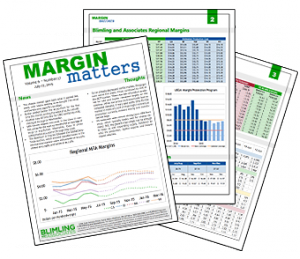 First, informed and actionable analysis via Margin Matters, a weekly publication providing information producers need to know. This publication provides a look at feed costs and forecasted mailbox milk prices in addition to the big picture fundamentals that are driving profitability. The second tool is customized and includes our personnel talking with individual producers about their specific operation. We take into account your production costs and the complexities of your milk shed. With your input, come up with a plan to protect profits. We also discuss strategy and answer questions as frequently as you deem necessary. The key to profitability is understanding how your milk price is determined and building your risk management plan appropriately. Contact Dairy.com for more information on how we can help.